For Queensland Railways (QR) the 1960s was the decade in which diesel locomotives displaced steam locomotives. It was also the decade when many branch lines were closed and QR started to focus on what it believed it should be doing. It was the start of the QR we have come to know today as a hauler of bulk commodities. Sydney Mail 1887 - This short history documents what was then the prestige Queensland Government Railways passenger train that travelled the line between Roma St and Wallangarra where it connected with the standard gauge passenger train to Sydney. This volume is a reproduction of the Queensland Division Supplements Numbers 1-10 to the Australian Railway Historical Society Bulletin first published in 1963 and 1964. One hundred years ago, striking tramway workers brought the sleepy colonial city of Brisbane to the edge of anarchy in an unprecedented general strike. This publication, by prominent railway historian David Burke, tells the story of American Joseph Stillman Badger, who electrified the trams, and of the events that led to the 'Black Friday' clash between 15,000 strikers and 2000 police on 2 February 1912. On the night of December 3 2003, the last load of cane arrived at the Moreton Central Sugar Mill, thus bringing to an end a 106 year association with Queensland's sugar industry. 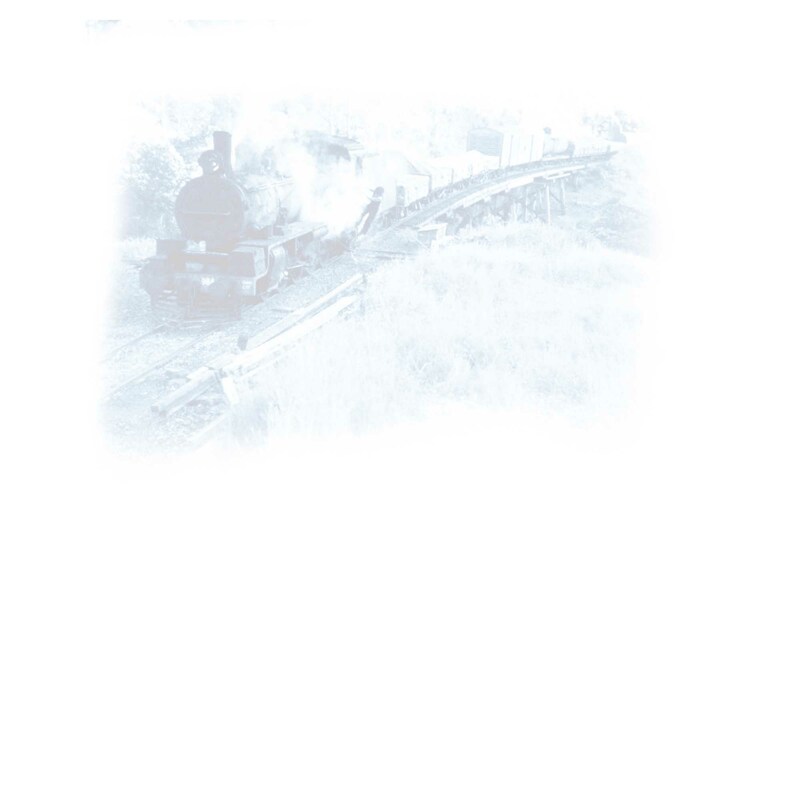 This CD contains over 40 pages on the history of the mill, its locomotives and tramway system. There are over 360 images from the steam era to the final years, 3 slideshows and 24 drawings of locomotives and wagons. With the mill now demolished and the tracks ripped up, this CD is an excellent resource for anyone with an interest in what was Nambour's Moreton Central Sugar Mill. Jack O'Leary and his union — the Australian Railways Union played a major role in bringing corrupt politicians to account, an action that deeply affected Jack’s life and his family. As I began documenting Jack’s story, drawing on crumbling newspapers and bound minute books — each page, recorded in copperplate handwriting, signed by Jack — the characters jostled one another to leap into life. My role would be to ensure they told their tales truthfully. This book explores the original copper lines built in the period 1910 to 1917 that branched from Cloncurry to Mount Cuthbert and Dobbyn, to Dajarra, from Malbon to Selwyn and the feeder tramways at Ballara and Trekelano. From the opening of the first railway In Queensland, the Ipswich Railway Workshops have played an important role in the state's history. This history is showcased at The Workshops Rail Museum where the past, present and future of rail in Queensland is presented amongst the heritage listed buildings of the Workshops. The story of the workshops and the people who worked in them recounted in the Museum is complemented by the detail presented in this edition of the Memoirs of the Queensland Museum. Romance of the Rail is living history, people telling their own stories, inspired and illustrated by the art of Janet Skinner. Well-known rail historian John Kerr has edited the text into a rare combination of art and anecdote.